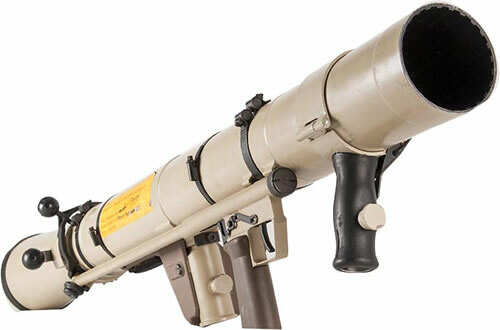 The AE84-RCL is a man-portable, reloadable multi-role Recoilless Rifle designed to fire Mecar’s M540/M550 series range of 84 mm ammunition. Other 84 mm ammunition types are compatible with the AE84-RCL. The rifle consists of a thin walled rifle barrel with a hinged breech locking Venturi recoil damper to the rear. Forward hand and trigger grips provide firing position comfort and a rear stock supports the weapon to the operators shoulder. The AE84-RCL is fitted with optical and reversionary sights as standard. Optional laser ranger finder and image intensification/night vision equipment can be readily fitted. Mecar’s rocket-assisted HEAT round is able to penetrate more than 300 mm of armour steel, and has an effective range of more than 700 metres. A ballistically matched training round is also available. 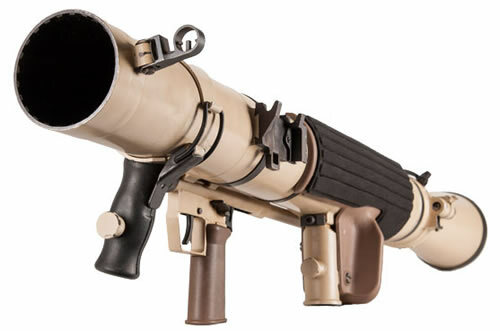 The AE84-RCL can be fired from any position. Bipod legs attach to the forward hand grip for added stability. Ammunition is loaded from the rear by opening/closing the hinged breech locking Venturi. The weapon is normally operated by a 2-man crew but is not essential. There must be sufficient space behind the weapon so that recoil blast is not obstructed.